The Washington Times has just reported on a batch of newly released emails, which pull back the curtain even further on the level of collusion and coordination that’s taken – and still actively taking — place among those who would like state attorneys general to use RICO laws to prosecute dissenting voices on climate change. These new emails show a number of folks from Rockefeller funded organizations working together to promote the InsideClimate News (ICN) stories to increase the echo chamber. 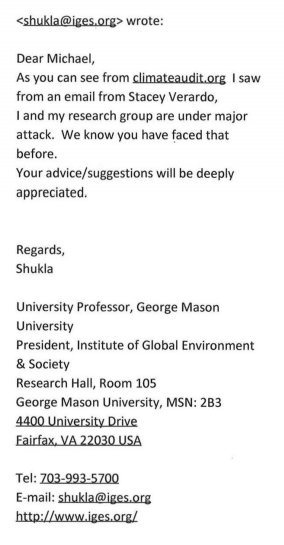 They also reveal that after George Mason University (GMU) professors Jagadish Shukla and Edward Maibach sent a letter in September 2015 with 18 other colleagues to U.S. Attorney General Loretta Lynch and President Obama asking them to explore RICO charges against climate “deniers” and their funders, the coordinated campaign went into “full damage-control mode,” as the Washington Times puts it. 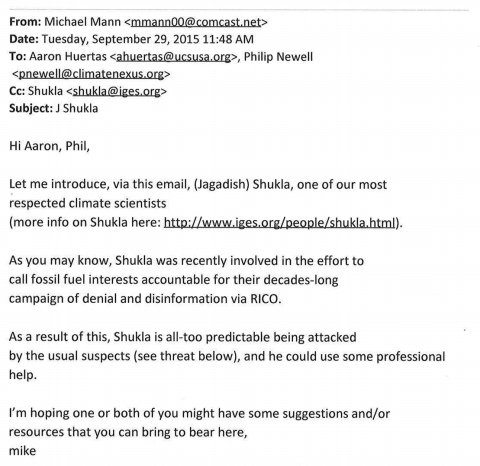 Mann then introduces Shukla to Aaron Huertas from the Union of Concerned Scientists and Philip Newell of Climate Nexus, asking if they “might have some suggestions and/or resources that you can bring to bear here” in light of the controversy the letter had instigated. To sum all this up, Newell basically tells Shukla, et al. to buck-up and double-down, suggesting that help was on the way in the form of InsideClimate’s upcoming series attacking ExxonMobil. 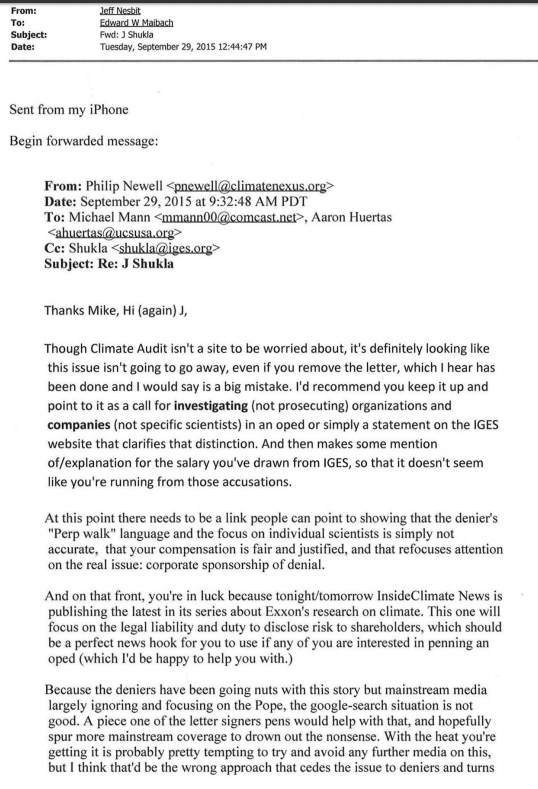 All of these organizations involved in these emails – InsideClimate, Climate Nexus, Climate Accountability Institute and Union of Concerned Scientists – are all funded by the Rockefeller foundations. In fact, Climate Accountability Institute and Union of Concerned Scientists are the groups that hosted the Rockefeller-funded 2012 conference in La Jolla California, which was held for activists to brainstorm ways they could help hasten the RICO prosecution strategy. 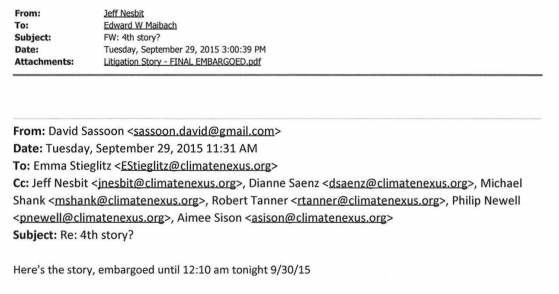 Of course, what the emails actually show is that Frumhoff was secretly working with state attorneys general to instigate climate investigations long before InsideClimate News and Columbia School of Journalism released their stories. Erich Pica of the Rockefeller-funded Friends of the Earth also met with Maryland Attorney General Brian Frosh in February, just days before Frosh announced he was considering an investigation into Exxon. 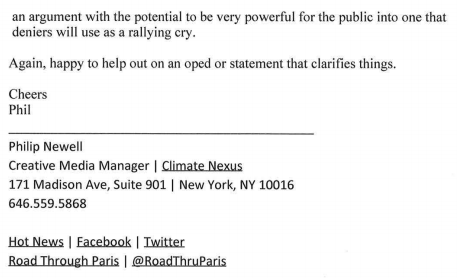 And we’d be remiss if we didn’t mention the emails first reported by Reuters that show staff with the New York attorney general’s office asking activist Matt Pawa, who sits on the board of the Rockefeller-funded Climate Accountability Institute, to not reveal to a Wall Street Journal reporter that he had briefed them before their March 29th press conference with Al Gore. That’s not a request one would typically make of someone involved in a “transparent” and definitely “not hidden” campaign. If activists are right about one thing, it’s this: their collusion isn’t hidden anymore.